In the course of tapping into external funding sources, innovators frequently encounter binding and insurmountable financing constraints, prompting them to discontinue, postpone or altogether abandon some of their innovative efforts, a key source of their growth and survival. This is even more so during economic crises, when profits collapse, internal resources dwindle and external sources risk drying up altogether. 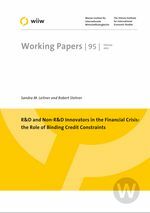 Against that backdrop, the analysis identifies the effects of prevailing credit constraints on innovative efforts of both formal R&D innovators as well as non-R&D innovators, which have mostly been neglected so far. It uses Latin America as its empirical platform and demonstrates that irrespective of the global financial crisis, which manoeuvred global financial markets on the verge of collapse, R&D innovators faced binding credit constraints while non-R&D innovators were unconstrained and remained unaffected by the crisis. In addition, there is no evidence that monetary policies aimed at stabilizing capital markets during the crisis had any noticeable alleviating effect on a firm’s probability to pursue R&D-based innovative activities. It also shows that innovative efforts of R&D and non-R&D innovators were driven by entirely different firm characteristics, while, on the contrary, almost identical characteristics determined whether both types of innovators faced any credit constraints at all.